Vyomesh asks Gopadevi what message she came to relay. Gopadevi says tilak muhurath is passing on, is he ready for the ritual. He says yes. He says he should not marry Radha as Radha is something else than she is seen. Vyomesh asks what she mean. She says he is so handsome that any girl would dream of marrying her including her, Radhha is lucky to marry him, she is Barsana’s most talented dancer and does not want to entertain Vyomesh’s family once even after her friends insisted. Vyomesh says Radha has to dance for him. Gopadevi says nobody can force Radha against her wish. Vyomesh says he is Radha’s would be husdband and she has to follow him. Balram/Baldev fumes thinking how to cook and via telepathy asks Krishna why did he trap him in this problem, he can eat and not cook. She stands up seeing Radha’s brother Dhama coming to her, but slips. Dhama holds her and asks if she is fine, she is so powerful that he had to use both hands to hold her. She asks who is he. He says he is Radha’s brother Dhama and asks who is she. She says Baldevi. He says Somone calls Dhama and he leaves telling he will return. Baldev/Balram sits tensely that he is seshnag and can do anything, but not cooking, Kahna trapped him in a big mess. He cuts vegetables angrily. Dhama returns and says she cuts vegetables so beautifully. She asks why did he return. He says to help her. She asks him to get vegetable directly from land, and he walks away. She thinks Kanha trapped him so badly, he will take revenge for sure. Vyomesh walks to Radha and says he heard she is a best dancer and if she can dance for her fiance. Radha says she left dance and will not. Vyomesh requests. Radha says she cannot and forget about it. Vyomesh gets angry and insists saying she should forget Krishna. Radha says she forgot Krishna long ago, why is he taking Krishna’s name. Gopadevi/Krishna thinks Radha is so innocent. He plays bansuri. Radha gets excited hearing sound and asks Vyomesh did he hear that sound. Vyomesh says no and angrily insists her to dance. Radha says never and runs away. She asks her friends if they heard a sound. They say no. She walks to Gopadevi and asks if she heard a sound. Gopadevi says yes. Radha excitedly asks really. Gopadevi says yes, it came from Radha’s heart. Radha warns her to stop taunting her, else she will inform her father. Gopadevi says she can read people’s mind and may be that sound is related to Radha’s boyfriend. Radha shouts to mind her business. Gopadevi says Vyomesh in her heart then, she should dance for him. Radha angrily fumes away shouting she will not. Gopadevi thinks Radha has to dance as Mahadev wants to watch it. 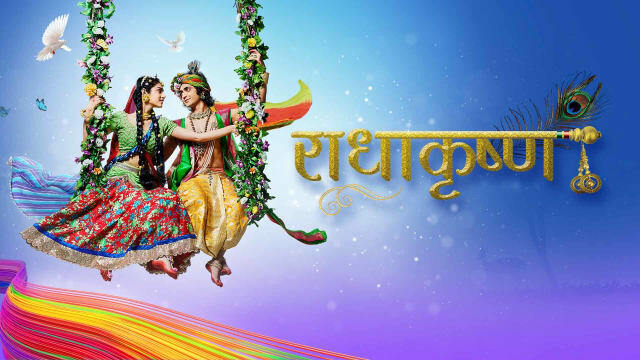 Gopadevi walks to Vyomesh with buttermilk and says she thought he must be angry after Radha denied his dance request, so she brought him buttermilk. He angrily shouts Radha has to obey her. She says if he does as she says, Radha will dance for sure. He asks what he has to do. She says he has to just back her when she speaks. Krishna gives moral gyaan that lotus has special quality, with increase in water level, lotus stem also grows, but when water level decreases, it does not shrink and lotus breaks after sometime; similarly human needs also increase and does not decrease, they have to decide how to control their needs. Precap: Gopadevi tells Narayan will be happy if would be bride dances. Vrishbhan says Radha will dance for sure. Krishna says it is time for Radha’s dance and dances with her.